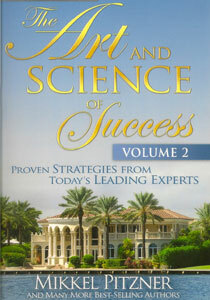 The Art and Science of Success is authored by Dr. Ray Blanchard, Matt Morris and other award-winning writers. Never before have these transformative leaders collaborated to write a book of profoundly authentic stories that will draw you in and find a lasting place in your heart. The Art and Science of Success” is a collection of some of the greatest success minds of our time. These authors are sharing their secrets to financial freedom, unprecedented personal success and unlimited human potential. This book will undoubtedly uplift, empower and motivate you to take action to fulfill your dreams. Contributing Thought Leaders include Matt Morris, Ray Blanchard, Ph.D., Traci Williams, Marc Accetta, Johnny Wimbrey, Juan Ramon Garcia, Blake Fleischacker, Aaron Byerlee, Wendy Estevez-Amara, Mikel Erdman, Alex Urbina, Dawnelle J. Hyland, Brian Mahany, Julie Eversole, Cheri Avery Black, Dr. Sandra M. Matheson, Demi Karpouzos, Dr. Ken Onu, Wali Mutazammil, Henry Maltez, Chico Humberto Ruiz Sanchez, Thomas Hoi, Oliver T. Asaah, Dr. Steven Balestracci and Dr. Terresa Balestracci, Jill Nieman Picerno, Francis Ablola, V. Celeste Fahie, Bettie Spruill, Esteban Srolis, Reverend Vincent Ezekiel Medina, Crystal Wolfchild, Edward Kinyanjui, and Ellen Reid.